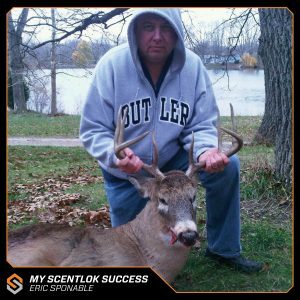 I wanted to share with you my success this year using many of John Eberhart’s scent control techniques. The buck measures out to the low 130’s, but the arrow through the skull makes it a unique trophy that I’ll probably not see again! I used my climbing stand along with a full ScentLok suit and insulated rubber boots with the whole thing supplemented with the Grabber body/hand/toe warmers.